Save Money on Your Monthly Payments By Buying in 2018! Save money on your monthly payments by locking in a lower interest rate before the end of 2018! Higher interest rates mean greater payments on your mortgage every month and with the rates predicted for 2019 that could be a significant chunk of change. Keep more money in your pocket by understanding where interest rates are headed in the new year. 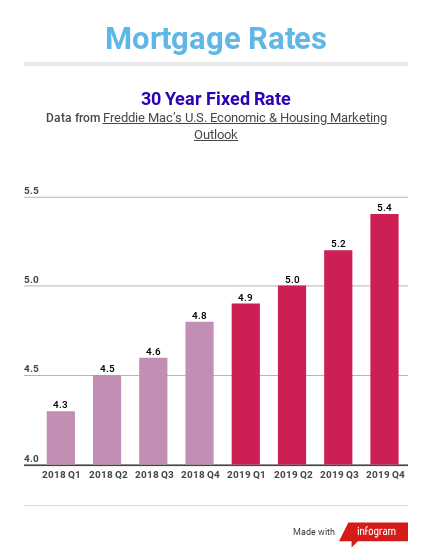 Check out this chart that shows the actual rates from the current year and where they are projected to increase throughout 2019. Although a 0.1% increase might not seem significant, it can increase your monthly payments depending on the amount of your loan. And, with housing prices also predicted to rise, it will likely cause a dramatic increase. The latest Home Price Index from CoreLogic shows a 6.2% appreciation in national home prices from 2017 to 2018 and predicts are 5.1% increase from 2018 to 2019. If these home price and interest rate predictions come true, you will be paying a lot more on your new home then you would if you bought today. Ready to BUY your dream home in the Whittier area? Work with the very best! Give The Domis Team a call today or visit our website at http://www.whittierhomes.com/!